Our original Blossom and Butterscotch My Little Ponies, from the very first year. It was an April morning in 1984. My little sister and I were so excited. A My Little Pony TV special was going to air that morning! My dad had a tape in the VCR, all ready to go. 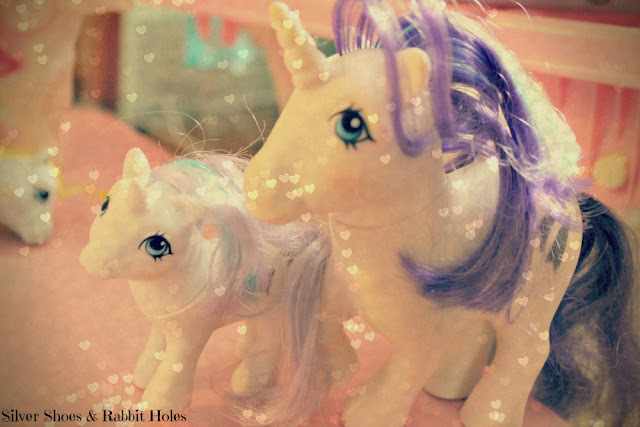 My sister and I had a few pony toys of our own. We had a few from the first release in 1983. I had Butterscotch, although I had wanted Minty, too. My sister had Blossom and Cotton Candy. 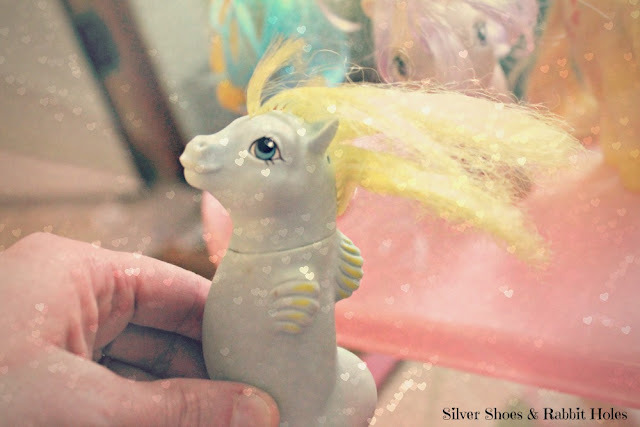 The following year saw the first release of unicorn and pegasus toys. I had Moondancer, a unicorn, and Medley, a pegasus. My sister had Glory, another unicorn, and a regular pony or two, I think. (The only original ponies to carry over into this group were Blossom and Cotton Candy. I was sad - no Minty for me.) We were curious to see which of our ponies made it into the special. And then time passed, our tape became worn and was probably taped over. I forgot all about the special, until my sister gave Big Sis both My Little Pony 25th anniversary 1983 reproduction collector's sets for Christmas. To go with the toys, she pulled Sis on her lap and YouTubed whatever My Little Pony stuff she could find. At the time, all she could find was the Sea Ponies' song. Tiny Bubbles, a baby sea pony. She was actually a third year release. Time went on. My girls wound up with a huge collection of vintage My Little Ponies, courtesy of our childhood stash at Grandma's. My friend Katie found more ponies on eBay, along with My Little Pony: The Movie on VHS and the original soundtrack on vinyl. (And Big Sis loved to play it. It made my ears bleed. Trust me : The voices on Friendship is Magic are much, much better!) We later upgraded the movie to DVD, and found lots of vintage television series episodes on DVD, too. Then newer ponies followed. And McDonald Happy Meal ponies. And suddenly, My Little Pony: Friendship is Magic happened and the ponies changed completely. After the TV special aired, my dad flipped it to Showtime and recorded Poltergeist. So My Little Pony shared a videotape with the movie that gave me nightmares for years. There's something fitting about that. I had a My Little Pony castle! It was awesome. I have no idea what happened to it or any of my ponies. They might still be at my parents' house somewhere. It's too funny that your dad recorded Poltergeist on the same tape! I would have been traumatized! I don't think we ever had any of the cool accessories. My cousin in Oklahoma did. 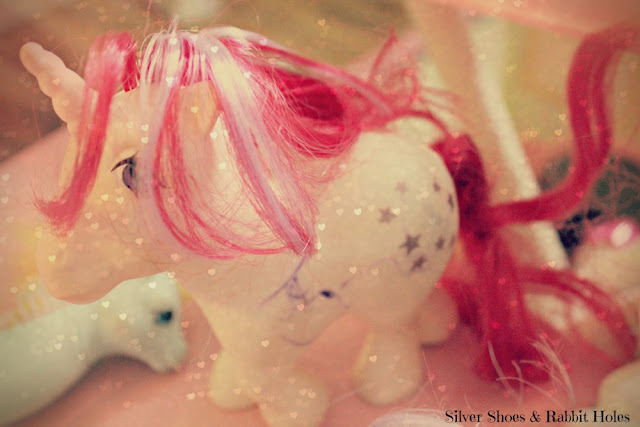 She also had a My Pretty Pony, the predecessor to My Little Pony. It's one of my favorite movies now... But I can't watch it late at night. 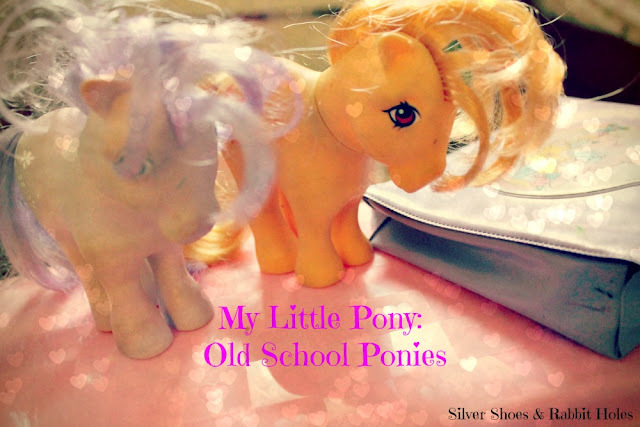 Love old school My Little Pony! They were so sweet. I had Cotton Candy. GREAT POST! My daughter Julia wants to say hi. "I liked the hearts on picture. I like the old fashioned ponies. I also like the underwater sea pony. I like your blog Danzel!!!!!!" Awww! It's probably a little late now, but "Hi, Julia! Thank you so much! I put the hearts on the pictures to make the ponies look a little prettier. They're old and dirty and their manes are messed up. That's what 30 years does to ponies... You are very sweet and very cute and you have an awesome mama!" Now you've got me all full of MLP nostalgia:) I was pretty obsessed with them and had a duffle bag full, the show stables and the pink Pony Mansion. I sold that last year on ebay since there was NO WAY it was ever ever ever going to leave my parents attic and come live at my house. The thing was ginormous! Had to get rid of it before my daughter spotted it and wanted it for her own. My kids are always finding things at my grandmother's that I wish had stayed hidden. We have no more room! :) I do know that ponies came with a special offer for a mail-order pony. I'd forgotten about it until I read it on mylittlewiki.org. I never had any of the cool stuff like the stables or the waterfall bath thingy. I don't remember the mansion! We never had space for bigger toys growing up, so we could only play with stuff like that at friends' houses. I wasn't the kind of kid who knew how to play with toys like ponies. I had to be in the game myself. I was better at playing mom to my Cabbage Patch Kids than making small toys talk to each other. It's hilarious to watch my girls now. My 7-year-old is so much like me. My little one can play with her Ponies or Littlest Pet Shop toys or any small play set for hours, though. We didn't really have space for it either, and it really didn't get played with much for that reason. It took up so much space to set it up that it wasn't really workable. And not that fun either, I mean, how on earth do you make ponies go into a kitchen to cook? I think I was blinded by all of the pinkness and that is why I HAD to have it. Once it got home and got set up, it was a definite meh. My favorite part of the whole deal was a toybox that came with a tiny little ducky pull toy and stacker. Yeah. Great big huge toy and I obsessed over a teeny tiny little thing like that. Kids! Haha! I hear you. Looking back, I'm glad I didn't get a lot of the things I asked for as a kid, because I don't know what I would have done with them. However, I did play with my Cabbage Patch Kids. All 9 of them. Really.